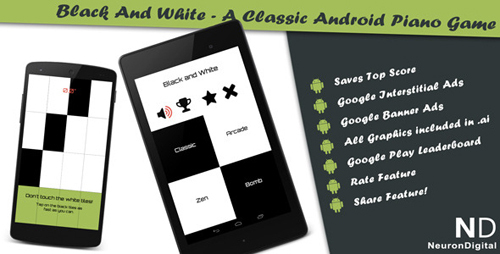 This is a classical Black and White game template for Android. The aim of the user is to tap on the Black tiles as fast as possible, while keeping his fingers away from the white tiles. The game includes 4 modes: Classic, Arcade, Zen and Bomb. The musical melodies, the black and white tile patterns can be easily modified. All text can be translated easily from the strings.xml file.